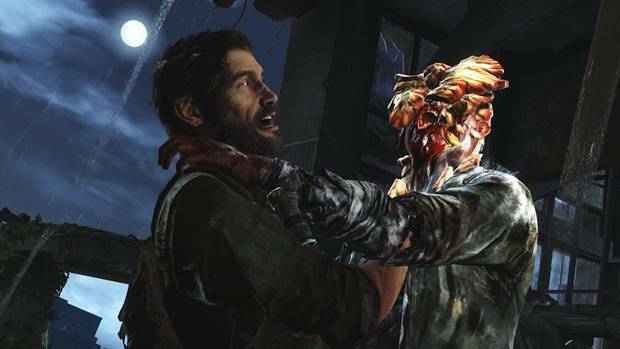 The Last of Us: a new take on survival horror? Happy to see me? Joel has his hands full with one of The Last of Us’ clickers. Clickers are not the sort of thing you want to tackle head-on. Appearing in Naughty Dogs’ post-apocalyptic The Last of Us, clickers are humans turned into monsters by a deadly fungal infection. Clearly, it’s something a little more potent than athelete’s foot then. They might be blind and have a head that looks as though a mushroom has imploded in on itself, but they’re deadly, thanks to their heightened sense of hearing and a guttural sonar-like clicking sound. If they hear a noise they’ll become alert, their head moving from side to side to locate the source. They can move pretty quickly, too, and trying to down them in a frontal assault results in a painful death – as I found out several times during my hands-on time with alpha code of the game. Clickers go for the neck, leaving little to the imagination. In his first encounter with a clicker, in an abandoned, shadowy, partially-destroyed building, Joel, the hero of The Last of Us with a sketchy past, has two options: skirt around the creature silently, making sure not to attract its attention, or pick up one of the myriad objects lying around – say, a bottle or a brick – and throw it, creating a distraction. That’ll get the clickers attention. I guide Joel behind a set of drawers, picking up a brick then lob it towards the corner of the room. The lone clicker perks up – what’s left of his head turning to the direction of the noise – and he shambles forward, trying to pinpoint where the noise came from. Before entering the room I fashioned a shiv – a makeshift knife – out of a pair of scissors and some tape that I’d found discarded in a room. Supplies are in short supply so you quickly learn to pick up whatever you come across. You never know when you’ll need it. The shiv is going to come in handy with clickers. Of course, you can use guns and pipes against them, but clickers are a hardy bunch and take a lot of bullets to down, leaving you open to attack from other infected nearby. Ammunition is also in short supply so stealth is often the best option in some situations. But back to our friend the clicker. The shambling monster is now sniffing around some desks in the corner of the room, investigating the noise. His back is towards me. My PR minder urges me to run towards the creature – done so by holding down the PS3 controller’s L2 button – hoping to initiate a silent kill. I hesitate too long and the clicker turns around, his teeth sinking into Joel’s neck. Clickers are only distracted for around a second so stealth kills need to be quick and without hesitation. I try again: tossing a brick into the corner of the room, attracting the attention of the clicker. I run towards him but this time I had realise I’d forgotten to fashion a shiv so have nothing to stab him with. The last checkpoint is reloaded. I try one more time, shiv made and no hesitation. I rush the distracted clicker. An on-screen prompt appears. I press the triangle button and Joel stabs the clicker, its twitching body falling to the ground. Be warned: Stealth kills on clicker must be flawless and perfectly timed. There is no room for error. This was an easy kill. It was just one clicker, but things get much tougher when confronted with several clickers and runners, a form of infected human that can both see you and runs towards you. Fast. A variety of strategies need to be used if you want to survive in The Last of Us’ unforgiving urban wasteland. Unlikely pairing: Joel is gruff and has a mysterious past; Ellie is a 14-year-old girl is a dab hand with a handgun. Tagging along with Joel is Ellie, a 14-year-old girl that he met while exploring the city, and Tess. Ellie’s had to grow up fast and she’s handy with a gun, although in my time with the game she was a little too eager at times. I died a couple of times from clicker attacks to the neck while silently creeping up behind one because she decided to start shooting at it! The Last of Us forces you to assess a situation then act. Gung-ho actions will result in death. If there’s a lone runner, then taking him out quietly, usually by strangulation, is the best option. And never use your gun if you don’t have too, especially if other infected are nearby. The noise will attract nearby infected. To help in assessing a situation, Joel has the ability to go into “listening” mode, activated by R2, which lets him see where the zombies are and plan his moves accordingly (quite how he is able to do that, I’m not sure). It’s a handy tool for seeing where clickers and other infected are. Another useful item that can be crafted is molotov cocktails, fashioned from scavenged bottles and petrol. Molotov’s are incredibly useful in clearing out three or four clickers congregating together, especially in the infected’s hive. A shotgun works wonders, too, but again, ammunition is in short supply and is the noise it will create worth it? Taking several clickers out at once is less terrifying than creeping around in the shadows, fearful that one will appear around a corner when you least expect it. The Last of Us manages to give you edge-of-the seat scares without being over-the-top frightening. It’s a survival horror game that forces you to think before you act and use your resources wisely. I like that. It’s out in June on the PlayStation 3. Sounds like it’s going to be a pretty challenging game to conquer. I can only imagine how bad it would be on its equivalent of Uncharted’s Crushing mode.